AS many as 17 people have been killed after another mass shooting at a US high school. Many others were injured when an assailant in a gas mask opened fire at Marjory Stoneman Douglas High School in Parkland, Florida. The shooter, identified as 19-year-old former student Nicolas Cruz, reportedly pulled the fire alarm before gunning down students as they fled from the building. Police responded to first reports around 2.30pm local time on Wednesday (6.30am Thursday AEDT). There were differing reports of the number of injured. AP reported at least 14. Al Boe News said at least 20. Local media stated there could be as many as 50. US Senator Bill Nelson told Fox News there were "many deaths" in the shooting. "This is a really bad day," he said. A fire alarm reportedly went off just minutes before the shooting started. Students were evacuating the school when the gunfire began. CBS reported that students initially thought the shooting was a drill, after they had one earlier in the day. "We thought it was a drill," a student told CBS News. "We already had one earlier this morning ... and then we heard gunshots, some students thought it was not that serious." Police initially reported that the suspect was still at large, but made an arrest just before 4pm local time. A federal official who spoke to The Associated Press on condition of anonymity identified the suspect as Nicolas Cruz. Broward County Sheriff Scott Israel said the suspect was an 18-year-old former student at the school. He said the teen was arrested without incident after he was located off the school grounds in a nearby community. He didn't give details of when the suspect had attended the school, but confirmed that he wasn't currently enrolled. "From what I understand, there was a time where he did attend the school. I don't know why he left, I don't know when he left." It's believed the shooter may have had a handgun as well as a rifle. The shooter was said to have been wearing a black hat, a maroon or burgundy coloured shirt and black pants. BNO News reported that the suspect was taken to hospital, but this has not been verified. The White House has responded to the news, with spokeswoman Lindsay Walters saying, "We are monitoring the situation. Our thoughts and prayers are with those affected". US President Donald Trump tweeted shortly after being briefed. In a second tweet President Trump said they are "working closely with law enforcement on the terrible Florida school shooting". US Senator for Florida Marco Rubio said in a tweet, "Just spoke to Broward School Superintendent. Today is that terrible day you pray never comes." UPDATED: At least one person is dead and dozens of people have been injured following a horrific mass shooting at a Florida high school. Coral Springs Police were called to Marjory Stoneman Douglas High School in Parkland following reports of an active shooter on the scene. The Broward Sheriff's office confirmed the suspected shooter is now in custody, but stressed the scene remains active. "So far we have at least 14 victims," the Sheriff's office said. "Victims have been and continue to be transported to Broward Health Medical Center and Broward Health North hospital." Police have warned locals to avoid the area as it's an "active police scene". "Do not attempt to get to the school this perimeter is LOCKED down," they said in post on Twitter. Images from the scene showed a number of people being treated by first responders. One injured victim was seen being placed into an ambulance on a stretcher. Police officers in helmets, bulletproof vests and armed with automatic weapons could be seen stationed at several points around the school. Police from neighboring Coral Springs advised teachers and students in the building to "remain barricaded inside until police reach you". The officer could not confirm how many were dead or injured and could only say there were multiple fatalities. "It's a fluid scene and we have multiple SWAT teams clearing the buildings to make sure they are no other shooters," he said. Sherrin Israel said the shooter was taken into custody near the area about an hour after committing the "horrible act." He confirmed the suspect was a former student but did not currently attend the school and that he was taken into custody without incident. "It's a terrible day for Parkland, Broward County, the state of Florida and the US," he said. "My own triflers graduated here. "It's catastrophic, there are really no words." 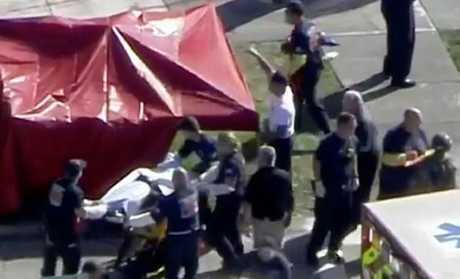 WSVN reported at least 20 people had been injured on the high school property, however it remains unknown exactly how many people were shot. Margate Fire Department told CBS Miami there could be as many as 50 victims. Fire Chief Dan Booker told the Miami Herald that the situation was a mass casualty incident and confirmed there had been at least one fatality. According to the Herald the gunman is a former student who came onto the campus and opened fire. Students reportedly heard a fire alarm go off just before the end of the day before gunshots broke out, adding to initial confusion. The shooter, who remains in custody, was also identified as a potential threat to students previously. Teacher Jim Gard said staff were told he wasn't allowed on campus with a backpack on. "There were problems with him last year threatening students, and I guess he was asked to leave campus," he said. Witnesses described chaotic scenes as desperate parents attempted to reach the school. One student at the school told CBS4 he was hiding in a closet. "All of a sudden there was a really loud noise…..people are crying the closet," the student wrote. He then asked when police were coming to help them. A student who was evacuated from the school told CBS News some people didn't think the incident was that serious at first. "We already had one earlier this morning ... and then we heard gunshots; some students thought it was not that serious." 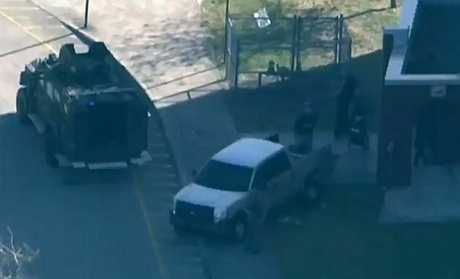 Students were seen racing from the scene as armed authorities surrounded the school, ABC News reported. The White House confirmed President Trump has been briefed on the situation. "The president has been made aware of the school shooting in Florida," the White House said. "We are monitoring the situation. Our thoughts and prayers are with those affected." Parkland, about 48 kilometres north of Fort Lauderdale, is part of the realtively wealthy strip of enclaves on Florida's east coast stretching between Miami and Palm Beach. It has already been a horror year for shootings in high schools in the United States. A 15-year-old female student in Texas was shot in her high school cafeteria in a town south of Dallas in late January, and just one day later two students were killed and more than a dozen injured when a 15-year-old boy opened fire on his classmates at his school in Kentucky. Earlier this month, a 12-year-old girl was arrested after she allegedly shot four students inside a classroom in Los Angeles.